Anti Inflammatory Range for Pharma PCD Franchise- The demand for pain-relieving medicines is quite high in India. Therefore, leading pharma company, Biofield Pharma brings a quality range of corticosteroid, a nonsteroidal anti-inflammatory drug range for pharma distribution. The company brings quality-assured Anti Inflammatory Range for Pharma PCD Franchise. These products are manufactured in the state-of-art unit which is certified by WHO & GMP units. We are highly concern towards the effectiveness, quality, and affordability of our products which makes us best in this business. The company offers opportunities for distribution of these medicines all across the nation through PCD Pharma Franchise business. The money-making venture has the capability to fetch good economic growth to your pharma business. The Anti Inflammatory Range for Pharma PCD Franchise would be beneficial in terms of investment. Since there is very less competition in this drug market. We, at Biofield present quality pain-relieving medicines in the form of a cream ointment, Gel ointment, Tablets, capsules, etc. The franchise business associates may get multiple benefits by joining us. The company assures the timely delivery of medicines with the help of hundreds of logistic partners all around the nation. The other benefits like marketing assistance, promotional gifts, etc. can be enjoyed by our franchise business partners. To know more about our PCD Franchise deals contact us at +91-98884-21594 or you can mail us your query through an email. at INFO@BIOFIELDPHARMA.COM. We have live chat facilities also for quick updates. The Anti Inflammatory Drugs specializes in relieving pain in any part of the body. These medicines are also counted as half analgesics that affect the central nervous system to block the pain signal to the brain. Anti-Inflammatory Therapeutics Market is expected to knock at $106.1 billion by 2020, with a CAGR of 5.9% during the forecast period of 2015-2020. This drug segment is majorly driven by the increase in cases of arthritis and asthma among people. There is an indispensable need for better anti-inflammatory therapeutics with lesser side effects and better efficacy in the market. 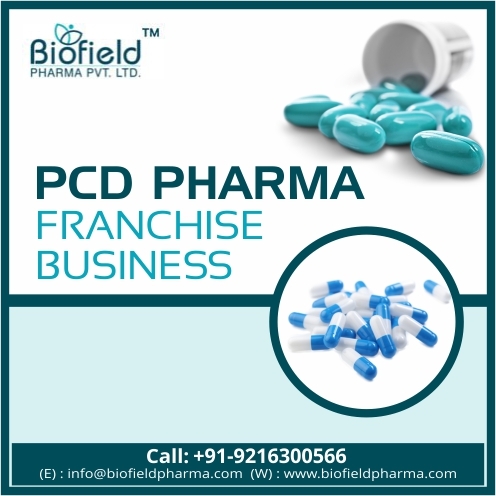 To provide quality pharma services through medicines leading pharma franchise company Biofield Pharma brings standard medicine range in the market through PCD Pharma Franchise Business. The distribution venture of pharma medicines has been gaining a good value to earn money through genuine investment. There is less competition in this drug segment, so, the investment in this venture for anti-inflammatory medicines has a futuristic scope. An ISO-GMP certified pharma company, Biofield Pharma brings an exclusive range of anti-inflammatory medicine in the market. The company is deeply engaged in bringing quality health reforms among the general masses. That is why we are bringing classic medication solutions in the market at reasonable rates. These medicine ranges are available with DCGI-WHO approval that are prepared with active ingredients that are brought from reliable resources. These medicines have certain quality checks. Biofield Pharma offers distribution opportunities for these medicines all across the nation with various benefits. The franchise owner will get quality medicines with DCGI-WHO approval. The company offers quick delivery support to its franchise business partners all across the nation. Free of cost marketing support is a plus at Biofield Pharma. You can get monthly promotional tools and exclusive rights of distribution by joining us. There is a good demand for anti-inflammatory medicines, therefore, the profit rate is good. We assure you to have the best business experience in PCD Pharma Franchise for these medicines. To know more about any other therapeutic segment franchise business, contact us at the details given below.